Recycled Bed Frames Welding Project! Potting Stand and Table made from recycled bed frames! Bed frames are an inexpensive source of steel. A recycling center here in Pittsburgh discards steel bed frames. Thinking that these frames would be a good construction source, I bought the frames for $1 - $2 apiece and tried making a project - the results are the potting stand and table. Comments for Recycled Bed Frames Welding Project! my brother bought some property with an old barn on it and when we were cleaning the building out we ran across a work type stand, (strong and sturdy). What was it made of?, -Bed frame. If you wish, I can draw some plans, measurements and directions. 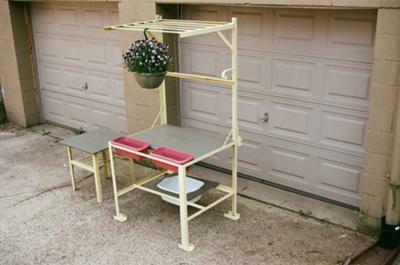 Although the potting bench shown is not based on it, you can go to the site Ana White and scroll down to " build a simple potting bench" and get some rough measurements from that site. If you want plans. etc. from me, give to me a mailing address or fax number and I will be glad to send the info. Please realize that my drawings will be on the amateur level, but I think that they will suffice. 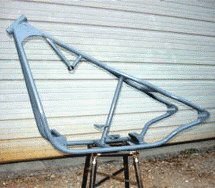 2, After constructing the frame I cleaned it with mineral spirits, then sprayed it with brown primer. I then applied the final color coat with a brush. The yellow paint came from Home Depot. I love and want to make one. Is their anyway to get plans for it or measurements. Also what did you paint it with? 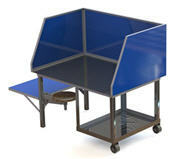 As your post said, these potting benches are workbenches for flower enthusiasts and gardeners. At one time these benches were mostly found in commercial nurseries and then home gardeners stated to use them. The general purpose is to keep all the tools, pots,soil etc. on the bench and then when the re-potting is done hang the plant on the rack above the bench and go onto the next plant. Very nice but i dont understand what it is exactly. A table for potted plants???? 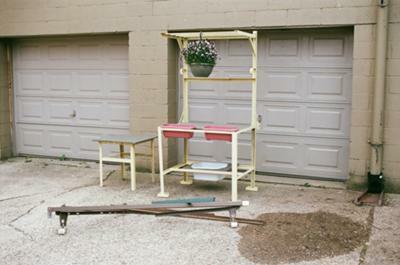 Is it like a "work bench" for someone that has a green thumb in the garden?